Replication defective viruses (also known as satellites) are those that need the presence of other viruses to help them reproduce. Not all viruses can reproduce in a host cell by themselves. Since viruses are so small, the size of their genome is limited. The lack of coded instructions causes some viruses to need the presence of other viruses to help them reproduce themselves. Such viruses are called replication defective. A satellite is a subviral agent composed of nucleic acid that depends on the co- infection of a host cell with a helper or master virus for its multiplication. When a satellite encodes the coat protein in which its nucleic acid is encapsidated it is referred to as a satellite virus. These viruses that are dependent on the presence of other virus species in the host cell are called satellites and may represent evolutionary intermediates of viroids and viruses. Helper virus: A helper virus is a virus used when producing copies of a helper dependent viral vector which does not have the ability to replicate on its own. The helper virus is used to coinfect cells alongside the viral vector and provides the necessary enzymes for replication of the genome of the viral vector. Satellite: A subviral agent composed of nucleic acid that depends on the co-infection of a host cell with a helper or master virus for its multiplication. Not all viruses can reproduce in a host cell by themselves. Since viruses are so small, the size of their genome is limited. For example, some viruses have coded instructions for only making a few different proteins for the viruses’ capsid. On the other hand, the human genome codes for over 30,000 different proteins. Therefore, the lack of coded instructions causes some viruses to need the presence of other viruses to help them reproduce themselves. Such viruses are called replication defective. Satellites depend on co-infection of a host cell with a helper virus for productive multiplication. Their nucleic acids have substantially distinct nucleotide sequences from either their helper virus or host. When a satellite subviral agent encodes the coat protein in which it is encapsulated, it is then called a satellite virus. Satellite viral particles should not be confused with satellite DNA. 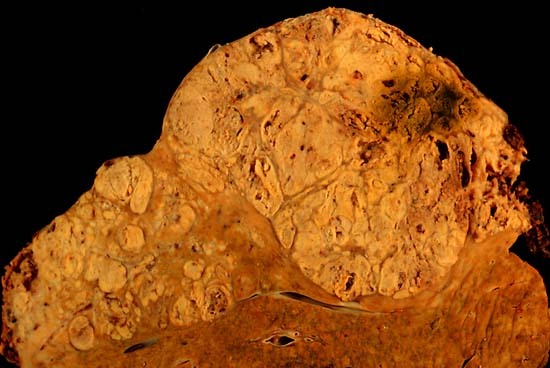 Hepatocellular Carcinoma: Cirrhosis leading to hepatocellular carcinoma (autopsy specimen). The photo shows a view of a longitudinal slice taken through the full length of the liver. The hepatitis delta virus of humans has an RNA genome similar to viroids, but has a protein coat derived from hepatitis B virus and cannot produce one of its own. Therefore, it is a defective virus and cannot replicate without the help of hepatitis B virus. In similar manner, the sputnik virophage is dependent on mimivirus, which infects the protozoan Acanthamoeba castellanii. These viruses that are dependent on the presence of other virus species in the host cell are called satellites. They may represent evolutionary intermediates of viroids and viruses. Hepatitis D, also referred to as hepatitis D virus (HDV) and classified as Hepatitis delta virus, is a disease caused by a small circular enveloped RNA virus. It is one of five known hepatitis viruses: A, B, C, D, and E. HDV is considered to be a subviral satellite because it can only propagate in the presence of the hepatitis B virus (HBV). Transmission of HDV can occur either via simultaneous infection with HBV (coinfection) or superimposed on chronic hepatitis B or hepatitis B carrier state (superinfection). Both superinfection and coinfection with HDV results in more severe complications compared to infection with HBV alone. These complications include a greater likelihood of experiencing liver failure in acute infections and a rapid progression to liver cirrhosis, with an increased chance of developing liver cancer in chronic infections. In combination with hepatitis B virus, hepatitis D has the highest mortality rate of all the hepatitis infections of 20%. Viroids are plant pathogens without the protein coat that is typical for viruses. Viroid RNA does not code for any protein. The replication mechanism involves RNA polymerase II, an enzyme normally associated with synthesis of messenger RNA from DNA, which instead catalyzes “rolling circle” synthesis of new RNA using the viroid’s RNA as template. The first viroid to be identified was potato spindle tuber viroid (PSTVd). Some 33 species have been identified. There has long been confusion over how viroids are able to induce symptoms in plants without encoding any protein products within their sequences. Evidence now suggests that RNA silencing is involved in the process. Virusoids are circular single-stranded RNAs dependent on plant viruses for replication and encapsidation. Since they depend on helper viruses, they are classified as satellites. Virusoid: Circular single-stranded RNAs dependent on plant viruses for replication and encapsidation. The genome of virusoids consist of several hundred nucleotides and only encodes structural proteins. Viroids are plant pathogens that consist of a short stretch (a few hundred nucleobases) of highly complementary, circular, single-stranded RNA without the protein coat that is typical for viruses. In comparison, the genome of the smallest known viruses capable of causing an infection by themselves is around 2 kilobases in size. The human pathogen Hepatitis D virus is similar to viroids. Viroids are extremely small in size, ranging from 246 to 467 nucleotide (nt) long genome and consisting of fewer than 10,000 atoms. Viroids were discovered and given this name by Theodor Otto Diener, a plant pathologist at the Agricultural Research Service in Maryland, in 1971. Viroid RNA does not code for any protein. The replication mechanism involves RNA polymerase II, an enzyme normally associated with synthesis of messenger RNA from DNA, which instead catalyzes “rolling circle” synthesis of new RNA using the viroid’s RNA as template. Some viroids are ribozymes, having catalytic properties which allow self-cleavage and ligation of unit-size genomes from larger replication intermediates. The first viroid to be identified was the potato spindle tuber viroid (PSTVd). Some 33 species have been identified. There has long been confusion over how viroids are able to induce symptoms in plants without encoding any protein products within their sequences. Evidence now suggests that RNA silencing is involved in the process. First, changes to the viroid genome can dramatically alter its virulence. This reflects the fact that any siRNAs produced would have less complementary base pairing with target messenger RNA. Secondly, siRNAs corresponding to sequences from viroid genomes have been isolated from infected plants. Finally, transgenic expression of the noninfectious hpRNA of potato spindle tuber viroid develops all the corresponding viroid like symptoms. This evidence indicates that when viroids replicate via a double stranded intermediate RNA, they are targeted by a dicer enzyme and cleaved into siRNAs that are then loaded onto the RNA-induced silencing complex. The viroid siRNAs actually contain sequences capable of complementary base pairing with the plant’s own messenger RNAs and induction of degradation or inhibition of translation is what causes the classic viroid symptoms. Virusoids are circular single-stranded RNAs dependent on plant viruses for replication and encapsidation. The genome of virusoids consists of several hundred nucleotides and only encodes structural proteins. Virusoids are similar to viroids in size, structure, and means of replication. Virusoids, while being studied in virology, are not considered as viruses but as subviral particles. Since they depend on helper viruses, they are classified as satellites. The Pospiviroidae are a family of viroids, including the first viroid to be discovered, PSTVd. Their secondary structure is key to their biological activity. The classification of this family is based on differences in the conserved central region sequence. Pospiviroidae replication occurs in an asymmetric fashion via host cell RNA polymerase, RNase, and RNA ligase. The Avsunviroidae are a family of viroids. At present three members are known. They consist of RNA genomes between 246-375 nucleotides in length. They are single stranded covalent circles and have intramolecular base pairing. All members lack a central conserved region. Replication occurs in the chloroplasts of plant cells. Key features of replication include no helper virus required and no proteins are encoded for. Unlike the other family of viroids, Pospiviroidae, Avsunviroidae are thought to replicate via a symmetrical rolling mechanism. It is thought the positive RNA strand acts as a template to form negative strands with the help of an enzyme thought to be RNA polymerase II. The negative RNA strands are then cleaved by ribozyme activity and circularizes. A second rolling circle mechanism forms a positive strand which is also cleaved by ribozyme activity and then ligated to become circular. The site of replication is unknown, but it is thought to be in the chloroplast and in the presence of Mg2+ ions. Avocado sunblotch viroid (ASBV) is an important disease affecting avocado trees. Infections result in lower yields and poorer quality fruit. ASBV is the smallest known viroid that infects plants and is transmitted by pollen and infected seeds or budwood. Trees infected with the viroid often show no symptoms other than a reduction in yield. However, they are still carriers and can pass the disease onto other plants. Symptoms in more serious infections include depressed longitudinal streaks of yellow in the fruit. The fruit may also become red or white in color. Symptoms in the leaf are uncommon, but include bleached veins and petioles. Rectangular cracking patterns also occur in the bark of older branches. Infected but symptomless trees have a higher concentration of viroid particles than those showing symptoms. Symptomless trees also represent a greater danger in terms of spread of the viroid. Prions are infectious agents composed of protein in a misfolded form, unlike all other known infectious agents which contain nucleic acids. Prions are responsible for the transmissible spongiform encephalopathies in a variety of mammals, including bovine spongiform encephalopathy and Creutzfeldt–Jakob disease in humans. 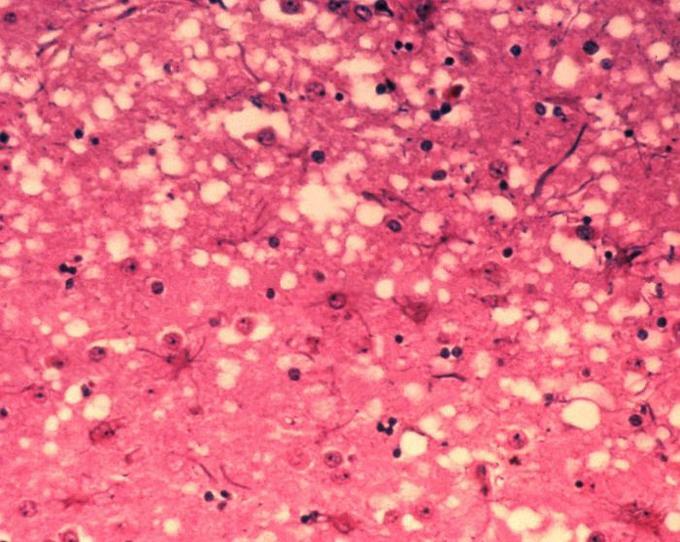 All known prion diseases affect the structure of neural tissue, are currently untreatable and universally fatal. Prions propagate by transmitting a misfolded protein state. When a prion enters a healthy organism, it induces existing, properly-folded proteins to convert into the disease-associated, prion form; it then acts as a template to guide the misfolding of more proteins into prion form. All known mammalian prion diseases are caused by the so-called prion protein, PrP. The endogenous, properly folded, form is denoted PrPC while the disease-linked, misfolded form is denoted PrPSc.The precise structure of the prion is not known. The first hypothesis to explain how prions replicate in a protein-only manner was the heterodimer model, which assumed that a single PrPSc molecule binds to a single PrPC molecule and catalyzes its conversion into PrPSc. The two PrPSc molecules then come apart and can go on to convert more PrPC. An alternative model assumes that PrPSc exists only as fibrils and that fibril ends bind PrPC and convert it into PrPSc. The exponential growth of both PrPSc and of the quantity of infectious particles observed during prion disease can be explained by taking fibril breakage into account. The protein-only hypothesis has been criticised by those who feel that the simplest explanation of the evidence to date is viral. However, recent studies propagating TSE infectivity in cell-free reactions and in purified component chemical reactions strongly suggest against TSE’s viral nature. Amyloid: Insoluble fibrous protein aggregates sharing specific structural traits. They arise from at least 18 inappropriately folded versions of proteins and polypeptides present naturally in the body. These misfolded structures alter their proper configuration such that they erroneously interact with one another or other cell components forming insoluble fibrils. They have been associated with the pathology of more than 20 serious human diseases in that, abnormal accumulation of amyloid fibrils in organs may lead to amyloidosis, and may play a role in various neurodegenerative disorders. Creutzfeldt–Jakob disease: A degenerative neurological disorder (brain disease) that is incurable and invariably fatal. In CJD, the brain tissue develops holes and takes on a sponge-like texture, due to a type of infectious protein called a prion. prion: A self-propagating misfolded conformer of a protein that is responsible for a number of diseases that affect the brain and other neural tissue. A prion is an infectious agent composed of protein in a misfolded form. This is the central idea of the Prion Hypothesis, which remains debated. This is in contrast to all other known infectious agents (virus /bacteria/fungus/parasite) which must contain nucleic acids (either DNA, RNA, or both). The word prion, coined in 1982 by Stanley B. Prusiner, is derived from the words protein and infection. Prions are responsible for the transmissible spongiform encephalopathies in a variety of mammals, including bovine spongiform encephalopathy (BSE, also known as “mad cow disease”) in cattle and Creutzfeldt–Jakob disease (CJD) in humans. All known prion diseases affect the structure of the brain or other neural tissue, are currently untreatable and universally fatal. Prion-affected tissue: This micrograph of brain tissue reveals the cytoarchitectural histopathologic changes found in bovine spongiform encephalopathy. The presence of vacuoles, i.e. microscopic “holes” in the gray matter, gives the brain of BSE-affected cows a sponge-like appearance when tissue sections are examined in the lab. Prions propagate by transmitting a misfolded protein state. When a prion enters a healthy organism, it induces existing, properly folded proteins to convert into the disease-associated prion form; it acts as a template to guide the misfolding of more proteins into prion form. These newly-formed prions can then go on to convert more proteins themselves; triggering a chain reaction. All known prions induce the formation of an amyloid fold, in which the protein polymerises into an aggregate consisting of tightly-packed beta sheets. Amyloid aggregates are fibrils, growing at their ends, and replicating when breakage causes two growing ends to become four growing ends. 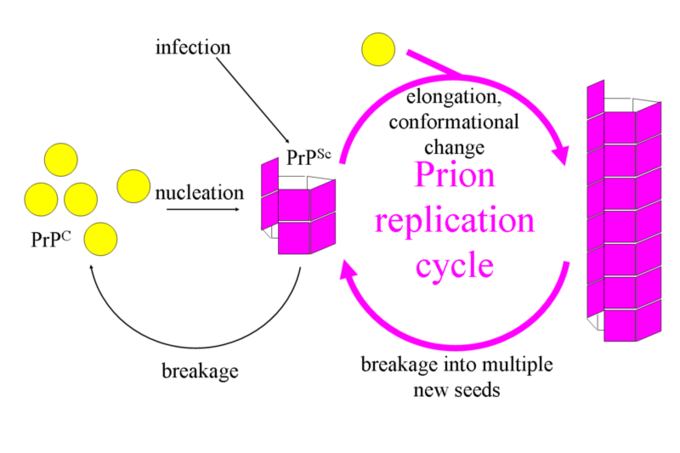 The incubation period of prion diseases is determined by the exponential growth rate associated with prion replication, which is a balance between the linear growth and the breakage of aggregates. Propagation of the prion depends on the presence of normally-folded protein in which the prion can induce misfolding; animals which do not express the normal form of the prion protein cannot develop nor transmit the disease. All known mammalian prion diseases are caused by the so-called prion protein, PrP. The endogenous, properly-folded form is denoted PrPC (for Common or Cellular) while the disease-linked, misfolded form is denoted PrPSc (for Scrapie, after one of the diseases first linked to prions and neurodegeneration. ) The precise structure of the prion is not known, though they can be formed by combining PrPC, polyadenylic acid, and lipids in a Protein Misfolding Cyclic Amplification (PMCA) reaction. Proteins showing prion-type behavior are also found in some fungi, which has been useful in helping to understand mammalian prions. Fungal prions do not appear to cause disease in their hosts. Diagram demonstrating how prion numbers increase: Heterodimer model of prion propagation. An alternative model assumes that PrPSc exists only as fibrils, and that fibril ends bind PrPC and convert it into PrPSc. If this were all, then the quantity of prions would increase linearly, forming ever longer fibrils. But exponential growth of both PrPSc and of the quantity of infectious particles is observed during prion disease. This can be explained by taking into account fibril breakage. A mathematical solution for the exponential growth rate resulting from the combination of fibril growth and fibril breakage has been found. The Fibril Model: Illustrating prion propagation. The protein-only hypothesis has been criticised by those who feel that the simplest explanation of the evidence to date is viral. For more than a decade, Yale University neuropathologist Laura Manuelidis has been proposing that prion diseases are caused instead by an unidentified slow virus. In January 2007, she and her colleagues published an article reporting to have found a virus in 10%, or less, of their scrapie-infected cells in culture. The virion hypothesis states that TSEs are caused by a replicable informational molecule (likely to be a nucleic acid) bound to PrP. Many TSEs, including scrapie and BSE, show strains with specific and distinct biological properties, a feature which supporters of the virion hypothesis feel is not explained by prions. Recent studies propagating TSE infectivity in cell-free reactions and in purified component chemical reactions strongly suggest against TSE’s viral nature. Using a similar defined recipe of multiple components (PrP, POPG lipid, RNA), Jiyan Ma and colleagues generated infectious prions from recombinant PrP expressed from E. coli, casting further doubt on this hypothesis.